Winners of 10 Chelsea gold medals. Also an excellent selection of seasonal house and garden plants, stone and terracotta pots and many othergarden products. After browsing around the gift and garden shop take a break and enjoy light refreshments in the relaxed surroundings of the Courtyard Cafe. Children's playground. Take the A17 to Terrington St Clement. 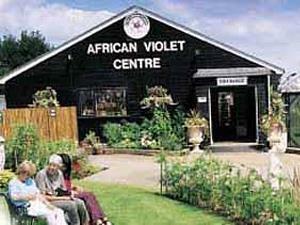 From King's Lynn station it is 5 miles to African Violet Centre Ltd.